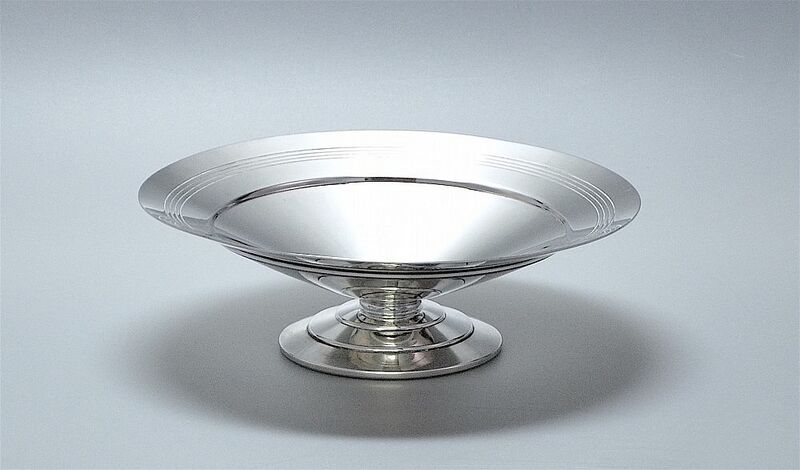 This fabulous silver plated footed bowl was designed by Keith Murray for Mappin & Webb in the 1930s. The wide edge of the concave top is decorated with 4 incised rings above the stepped down bowl. The round foot has three tiers. The base is signed "Triple Deposit Mappin & Webb Prince's Plate London & Sheffield" and has a stylised triskelion. There is a date letter "K" within a shield shaped cartouche which may be for 1939. The foot is also stamped "W27701 Rd 772183".